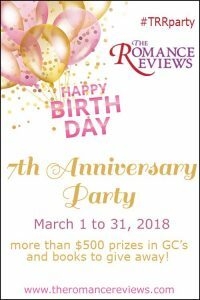 Jaci is participating in the The Romance Review’s Virtual Anniversary party! For the whole month of March, you can join the celebration and enter for your chance to win— there are more than $500 in prizes from 70 authors. Jaci’s contribution will be a signed copy of her latest release, Shot on Gold. Head on over starting March 1 to play games and answer questions to increase your chances of winning. I had pre-ordered the paperback and it came today!!!!! I can’t wait to dive in. I can’t wait for the party to begin!!!! !